There are a few things I miss when I’m on the road, outside of the country. Marine weather reports for the Strait of Georgia, hockey scores, and my morning walk to the local Tim Hortons with John on his way to work. We’re getting ready to drive across America to visit his family and before setting out, I had to enjoy one last Tims in Vancouver, and I made it a special one. Tim Hortons is now offering espresso products, at a limited number of locations, that include lattes made to order with premium ingredients including freshly ground (Arabica whole) espresso beans and freshly steamed 100% Canadian Milk. For my last sip of Canadiana this month, I selected the cappuccino ($2.99), throwing off my familiar host who was ready to punch in my regular morning order at my local Tims in Downtown Vancouver. I usually order a medium coffee with 1 milk (no sugar) and feared that a new flavour combination with the cappuccino would still be too sweet or that the milk would twist my stomach since I usually can’t handle much in the morning. 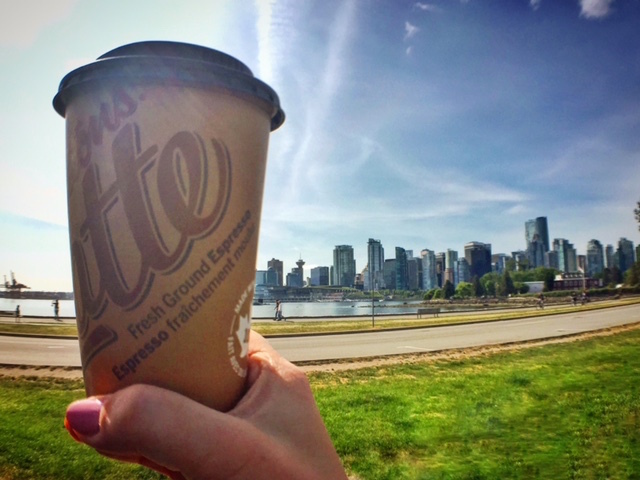 I walked into Stanley Park, holding my brand new cup of brand new cappuccino to salute the city that I’ve been away from for so long this season, and I took my first sips. The cappuccino was light, creamy, but not overpowering. It was even milder than the Dark Roast, since the espresso is roasted at different levels and with a different technique, but it still had a good kick. It had the richness I was looking for in my morning coffee, with the lightness of fresh milk as opposed to a heavy cream. It was a very enjoyable send off. Follow Tim Hortons on Facebook, Twitter, and Instagram for more information and beverage inspiration. I will draw two winners at random from all entries at 12:00pm on Tuesday, May 31, 2016. Update The winners are Tammy H and @cassdev23! Views are my own. This post is sponsored by Tim Hortons. We enjoy Tim’s hot chocolate. I’d love to win a $50 Tim Horton’s gift card – that surely would buy my husband & I quite a few espressos! I would love to win this — I’m probably at Tim Horton’s too often. Tim Horton’s is what a sleepless mama needs! Yes, please! That would be amazing. I love hot chocolate but would try something new, too. Yum! I enjoy going to Timmy’s! Yum! Coffee and a honey dip for me !? great contest. I would to start a Tim’s coffee addiction to go along with my other ones. I love TimHortons, I would love to try their new espresso!! My husband bought some Tim Horton’s ground coffee this morning so he could enjoy it at home as well as in the store. Good for Tim Horton’s! Their quality has gone up in past years. My favoaurite place to go in the morning is TimHortons! I need their coffee to wake me up! 🙂 Fingers crossed to win! I drink so much Tim Hortons coffee I should buy shares lol ! Yes, please! Love Tim Hortons! These would be great to get me through my shifts at the hospital! Love the tea and who can’t resist the tim bits! Time Hortons coffee is the reason I get up in the morning! ♥ Tim’s! Consistent quality and always something new lately! This would be great as coffee is so important! I am curious to try it. Tim’s dark roast is pretty good — hoping for the same with the espresso. You can never go wrong with Tim Hortons as it’s truly Canadian! Gotta love Tims:) Thanks for the chance to win! Tim Horton’s coffee is the best around. I enjoy my Tim’s coffee. Love the rich flavor. I love Tim’s. I go there every Saturday morning. That’s great that Tim’s is expanding their product line up to include espressos! Love Timmies!! Thanks for the chance!! I love Tim’s. I eveb have the Tim Hortons kcups at home when I can’t make it out for a coffee. I love my double double but would be open to trying something new. NEW Expresso products from Tim’s – bring it on! But as usual still the best-tasting coffee around. Oh, I’ll have to try a cappuccino soon! The best coffee ever omg omg fingers super crossed ..addicted to my Timmies ??? Wow this is great news! I can’t wait to try their cappuccino. Would love to try Tim’s new products! Love my double double and ice caps! I love Tim’s and would love to try out the new products. So looking forward to trying these! Have a great road trip and we’ll keep the coffee fresh and hot for your return! Thanks for the opportunity to win! I love love LOVE Timmies! I like their muffins ! Would love to try a Timmy’s fancy coffee. Normally a black coffee only gal, but could try a latte or two. I would love to try Tim’s new espresso! I love Tim Hortons! Thanks for the awesome giveaway! I sure would enjoy this? I enjoy Tim’s and usually grab one for my trip home. Plus the prices are so reasonable and your money goes a long ways at Tim’s. Donuts & Coffee. There’s no better combination! WOW. Way to go Tim! Love me some Timmy’s grilled cheese! Thanks for the chance! I love my dark roast! Thanks for the chance, Tim’s. You’re still the best place for a quick stop for inexpensive wholesome food. thanks!! I Love Tim Hortons! Great giveaway! Love that rocket fuel to get through the day! My dad loves Tim Hortons. Lucky for us there is one a short walk from his retirement residence. Thanks for the chance to win. I give the card to him if I did. Loce the coffee with a muffin mid-afternoon. Nothing like a good caffeine fix! I love their iced cap since I find it very refreshing in the hot weather. Didn’t know they had a regular cap though -good to know. I could really use a Tim’s to wake me up right now. Only a few blocks away. as they say on South Patk, “Timmy”. Great prize. Thanks for posting. Bring it on Tim’s! My hubby LOVES tims coffee and would much rather their coffee over mine!! I would love to win this for him. I absolutely love my Tim Hortons!!! It was very nice to return home to see a Tim Horton’s ad yesterday at the airport. Great! I’ve never heard of the Tim Horton’s espresso creations! I always miss my Timmies when I am away on vacation. Perfect for my coffee-loving heart! I love Tim Horton’s coffee! thanks for nice giveaway.i love Tim Horton’s french vanilla and coffee.would be nice if i win. I would give this to my daughter who works so hard. Tim Horton’s, one of my favourite places for lunch. My nearest (and dearest) Tims is at 4191 LOUGHEED HIGHWAY in burnaby. LOVE me some tims!!! It would be great to win a $50 digital Tim Hortons Card. I would like to try out a brand new Tim Horton’s espresso creation. For a Second entry i tweeted. THIS IS THE BEST KIND OF GIVE-AWAY. I always get 10x more excited for tim hortons giveaways lol. It’s my favorite. I’ve been hooked in their French vanilla lately! I love Tim Hortons! Can’t wait to try out their new products. I would love to try these! They are always coming up with something new. Timbits, yum. Thanks for the giveaway. Our road trips seemed to involve driving from one town’s Tim Hortons to another town’s Tim Hortons. Nothing like a nice shot of Timmie’s to wake up the day! I love Tim’s; quintessentially Canadian. My fave drink is the plain old Double Double, and I love the Iced Cap. I would love to try these! They are always coming up with something new! That’s great news Timmies is now serving espresso! My favorite would be the cappuccino I think. This gift card would bring a lot of joy to buy treats over the summer! I’d love to try the cappuccino! I love tummies! Whether home or on the road we always stop in. I would like to try Tim Horton’s new espresso products. I really enjoy the iced capps with chocolate milk! I frequently end up at Tim Hortons with my walking partner – we both like the coffee. I still have to try their espresso. I love it when Tim comes out with new items! I’d love to try the new products. I’m not a big fan of drip coffee, so this sounds much better. I love that Tims is offering these new products! Can’t wait to try a cappuccino! Love Timmies! Thanks for the chance. My dad needs this; he loves their coffee. I could get so many timbits with this!! Timmy’s is my favourite coffee. I would love to win this to try out their new espresso products. Tim Horton’s is my favourite! I love their lattes! Retweeted! Love me my Timmies!!! Night shift worker. Give me all of the coffee. I have never had a digital Tim’s card but would love to try it. Love Tim Hortons! Not sure how to use the digital card but would love to try. I would spend the whole $50 on timbits! My favourite snack! I’m ready to try the espresso. i would love to try Tim’s new creation!! I haven’t yet had my morning coffee, so I can’t think of anything worthwhile to write. I’d love to get a Tim’s card… I go there all the time! I heart Tim Hortons !